Who are these men without their miraculous beards? The ability to grow the perfect, effortless beard falls on a few lucky men. Throughout history, there have been a few beards that seemed to bring some sort of mystery to the table, a miracle, a strange power that drew people in and captivated them. Swarthy, strong beards have existed since the dawn of time, with documentation of such. Admiration of beards, just like the appreciation of cats, has been a ‘thing’ since the dawn of time! In order to put all of this beard love into perspective, think about how many powerful men had beards. Men whose work changed the lives of thousands, struck fear into some, and changed the way that many felt about spoken word. All of these beards changed the way of the world that surrounded them! Think about it. Who is the most OG of the beard of all times? Jesus of Nazareth. Jesus, the original bad boy of beards, existed in a time when bearded men had no choice but to be beardy. It’s worth noting that Jesus helped others promote the agenda of cleanliness being next to Godliness, so you know he was down with some daily maintenance to keep his face fresh. 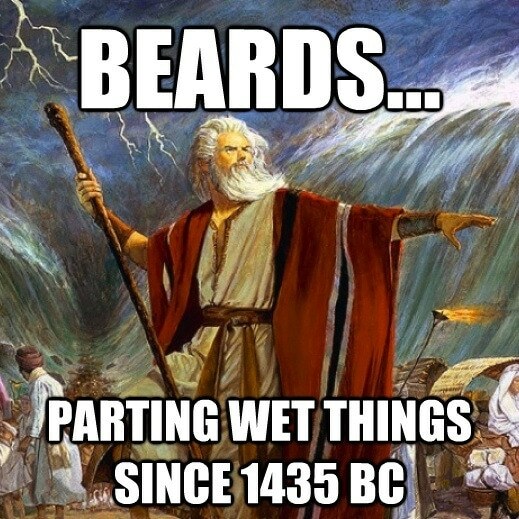 Beard oils have existed since the dawn of time! As early as the Old Testament, even the legendary Moses and others of his time started using oils and pumice to help style their hair and beards. Oil with ashes were also used as soap, to keep the skin clean and hair moisturized. Some things, such as basic beard care, are just that simple. While Jesus, the miracle worker, had a great beard, there are few more significant beards in history. While Jesus changed the world in a radical way, hundreds of years later, a far darker beard appeared in Russia. Rasputin’s beard, something that everyone remembers from elementary and middle school history classes, is a large part of a large, far more sinister man. Given that Rasputin was six foot four and his beard descended to the middle of his chest, the mystical power of his beard cannot be denied. Given that Beardilizer wrote about how to help a winter beard from breakage, last week, it’s easy to tell that Rasputin opted to forgo daily beard care in pursuit of a far more murky and villainous goal. That beard, however, glorious, terrifying, and is part of the mysterious man. How many other beards are synonymous with the person? Shakespeare? Perhaps, since his stylish beard is evidence that beard wax changed the way that men styled their beards. Imagine that pointed beard but without the polished look. How gross. The beard clearly makes the man and these men have all gone on to change the world around them, for better or for worse. There are people who have just now started freaking out over the beauty of beards clearly aren’t with the times, nor did they pay attention in school. Think about it: even the Egyptians had their own tight, perfectly maintained beards! These beards span the start of humanity as we know it and are part of our history. Imagine a world without the magic that was brought into the world from these men and their manes.